Print can play a critical role in e-commerce. 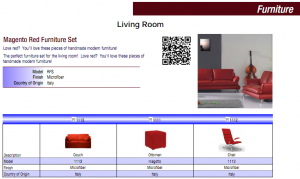 Print catalogs drive more traffic to e-stores than any other kind of direct marketing. They’ve even been shown to do better than Facebook and Twitter combined. And best of all — print is persistent. It does not disappear with a mouse click. A print publication will still be sitting on your customer’s desk after she gets back from lunch. So why haven’t you made a print catalog lately? Is it that you can’t imagine how you are going to pull together all the content and images required for a quality publication? Well, if you’ve been working hard on content for your Magento e-commerce site, then you are in luck. Not only can you use the content today, but going forward you only have to maintain it in one place — your Magento site. Still, we always get the same question: Is my website content really suitable for print catalogs? After more than 20 successful years in automated catalog publishing, including several years of publishing from Magento e commerce sites, we have some useful insight to this question. 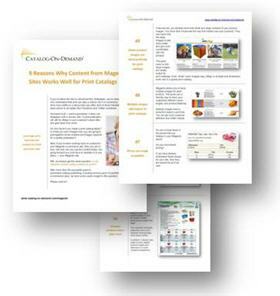 We have compiled these thoughts into a free illustrated whitepaper titled "9 Reasons Why Content from Magento Sites Works Well for Print Catalogs". If you've been working with Magento a while, you know about the "grouped product" feature. It lets you put several products on one product page. This is particularly useful for sets of related products. Magento does an excellent job of letting you set up products that have options — called "configurable products". A typical example is shown in the Magento demo with the Zolof t-shirt. This t-shirt comes in three sizes and two colors. This works out to six different combinations, which Magento calls "variants". You set up each variant as a simple product.